I first came across the CZ pistols at the gun range in Oceanside, California where I was a member. The CZ’s were marketed as “affordable” pistols (meaning “cheap”). Since I had already fallen under the spell of the 1911 and owned a SIG, I didn’t pay much attention to the cheaper guns that were available. This began to change when I was at the range one day and the fellow in the lane next to me was shooting a CZ-75B. We began to talk and he asked me if I would like to shoot his gun. I took this to mean that if I said no I would probably insult the guy, so I agreed and picked up his CZ. I was immediately struck by the comfort of the gun, as it was very well-balanced. Shooting it revealed that the gun was accurate and had a trigger-pull in DA mode that was very much like the SIG that I owned. At this point I began to look more closely at the CZ guns. I did some research over the Internet and discovered that the manufacturer is a very old and very well-known Czech company that dated to the early 1900’s. Very much in the European tradition of firearms makers, CZ had developed a full line of pistols and rifles that dated back to pre-WWI. The company was corrupted after WWII by the Soviet Union and began mass-producing firearms for the Warsaw Pact countries. This precluded import into the United States, but distribution was common in the European NATO-allied countries where CZ firearms were well-known for their quality and performance. After the fall of the Iron Curtain, CZ had a big inventory of guns and no one to sell them to. An enterprising US importer began bringing their guns into the US market and the basic CZ pistol – the 9mm CZ-75B could be purchased for under $300.00 for a time. As time has gone by and the guns have become somewhat more well-known the prices have begun to creep up. 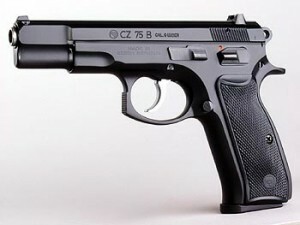 I bought my CZ-75B in 1997 for $319.00 including two 15-round magazines. Close inspection of the CZ-75B reveals a gun that was designed to be a military sidearm. No frills. The guns are constructed of steel and are most commonly provided with a black “polymer” baked-on finish that is actually quite tough and durable. The roll-markings on the slide tend to be somewhat obscured by this finish and this effect is less than desirable esthetically. Also, the importer has stenciled their name and location in gold-colored ink on the right-hand side of the slide. I wish they wouldn’t do that! The grips on the stock CZ-75B are of black hard-plastic and are uncomfortable. Hogue sells a soft-rubber wraparound grip that compliments this gun nicely. All the cosmetic issues aside, shooting the CZ-75B is a revelation. Excellent trigger out of the box. Excellent accuracy. One of my friends who owns a SIG 229 regularly calls and asks me to let him use my CZ when he is shooting in friendly range competitions. The CZ is more accurate than his SIG! I have run many different brands and types of 9mm ammunition through my CZ-75B and I honestly do not recall a single malfunction. Accuracy is excellent with three-shot groups delivered from a Weaver stance yielding 2.0″ to 2.5″ at 15 yards and 3.5″ at 25 yards… provided a good day and a steady-hand, of course. The gun takes down and reassembles easily. Parts are readily available from the CZ USA website. CZ manufactures a broad line of handguns and rifles. I recently purchased a CZ75 PCR, a compact 9mm pistol with a de-cocker rather than standard safety. This gun is also highly accurate and very comfortable to shoot. The CZ rifle line includes semi-auto and bolt-action guns that are considered top-notch. CZ pistols come in calibers from .380 to .45 with some “race-gun” models available. Finishes range from blue to “black-polymer” to stainless steel. The CZ line of pistols and rifles represents perhaps the best value of any line of firearms. I would encourage anyone to explore these guns and “spread the word”. My experience with these fine guns tells me that the CZ line is one of the best-kept secrets in today’s menu of firearms. The, CZ 75 is a recoil-operated, locked breech design that employs Browning style, link-less locking system. Early versions (CZ 75) featured no firing pin block, while modern versions (75B, BD, DAO etc) have such safety. Also, all modern versions feature a CZ-85 style trigger guard. 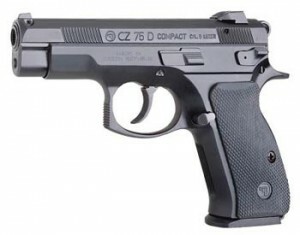 CZ-75B has a frame mounted safety and slide stop. CZ-75 BD has a frame mounted de-cocker, and CZ-75 DAO has no manual safeties. 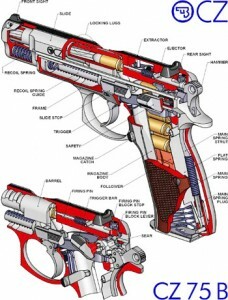 The gun is available in basic DA/SA with manual safety (CZ-75 B), in DA with de-cocker lever and no manual safety (CZ-75 BD), in DAO without any external levers (CZ-75 DAO). Compact B and BD models also available in 9 mm, with a shorter barrel (100 mm) and 14 rounds magazines. Cadet conversion kits and complete handguns available in .22 LR to provide low-cost training and plinking ability. 206 mm / 8.1 in. 138 mm / 5.4 in.